Coumarin, 7-hydroxycoumarin and dicoumarol molecularly imprinted polymers (MIP) were synthesized by bulk polymerization. Methacrylic acid and 4-vinylpyridine were tested as functional monomers and methanol, ethanol, acetonitrile, toluene and chloroform were tested as porogens. The binding capabilities of the imprinted polymers were assessed by equilibrium binding analysis. Highest binding capacity was obtained for MIP prepared for the template 7-hydroxycoumarin synthesized in methacrylic acid as functional monomer, chloroform as porogen and methanol/water as analyte solvent. Scanning electron microscopy analysis documented its appropriate morphology. ATR-FTIR spectra confirmed successful polymerization of MIP. Coumarin structural analogues were employed to evaluate the polymer selectivity and it was found that polymer prepared for 7-hydroxycoumarin was selective for its template molecule. Kinetic studies showed relatively fast adsorption of analytes to MIPs (1 h). Rebinding properties of MIPs were evaluated by adsorption isotherms. The calculated data fitted well with experimental data showing that Freundlich isotherm is suitable for modelling the adsorption of tested coumarins on prepared MIPs. 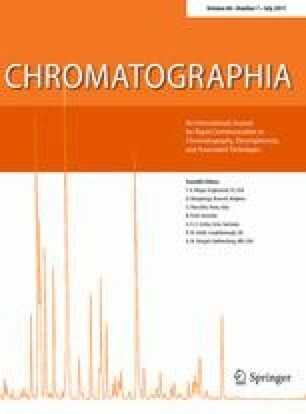 Applicability of polymer prepared for 7-hydroxycoumarin was tested for the selective extraction of coumarins from the sample of chicory. The online version of this article (doi: 10.1007/s10337-017-3325-z) contains supplementary material, which is available to authorized users. This work was financially supported by the Slovak Research and Development Agency under the contract no. APVV-15-0355. The authors declare that our research is in compliance with ethical standards, there is no conflict of interest regarding the publication of this paper, and our research did not involve human participants or animals.